Woke up at 10am, didn't sleep that well. I have decided to not use the olive oil I have in the cupboard for this raw food challenge because of what David Wolfe said in his Longevity Now book. He said that one of the biggest improvements people will feel on a raw food diet will be from eliminating hydrogenated oils. So I ordered some cold-pressed olive oil in a stainless-steel can from Oliveology.co.uk. I am looking for recipes in Alissa Cohen's raw food 'cook' book but most of them have olive oil, agave nectar or added salt in them, or nuts. I don't have any raw nuts yet, and I also don't have raw soy sauce (Nama Shoyu) which she uses occasionally. I choose not to eat agave nectar because it's concentrated sugar, and I also don't eat salt now as an experiment, although I think it will be fine once I bring it back into the diet. The other thing she uses a lot is a dehydrator, and mine is broken. I am interested in trying a water-rich alkaline diet for a while, and not have too many dry/ dehydrated things, since before I have noticed that they can be difficult to digest and make me feel a little heavy. So I will stick to simple fruits, fruit salads, smoothies and salads for now. Smoothie: 1 tbsp spirulina (algae), 1 tbsp chlorella, one grapefruit, water. 2,000 mcg vitamin B12 spray (under the tongue, methylcobalamin). Did one hour of Bob Beck's blood electrification (weak electrical current in the wrist to eliminate single-celled organisms in the blood - i.e. parasites). Sounds crazy but is a surprisingly effective tool to boost the immune system, in my experience. Salad (picture at the beginning of this article): plenty of green lettuce, raspberries, cherry halves, soaked dates, soaked goji berries, sliced prunes (organic but maybe not raw), ground flax seeds, ground sunflower seeds, pear slices, banana strips, lemon juice, soaking water of dates. No added salt, spices or oil. Supplements: 4 grams (approx) of ascorbic acid powder (vitamin C, 'megavitamin therapy'), iron-rich water, probiotic. All with a pint of Brita filtered tap water. The salad had too many things mixed, many of the flavours didn't go together very well. But the soaking water of the dates works well for sweetening the salad. And dried prunes seem to go well with sour raspberries. The pear and the banana seem to taste odd this time of the year. Feeling cold. It is cold outside and indoors. I want to drink tea but I won't. Some slight starch cravings. I bought fresh raspberries because I read in Alissa's book that frozen berries are often blanched (in boiling water) before freezing. It is a shame if it's true, though, because frozen berries would be so much cheaper. I have very slight headache and tension in the jaw. I'm taking a little nap. Had lots of crazy, somewhat chaotic dreams - bordering on nightmares. This seems to be a typical detox symptom I have. Ate 1/2 banana and lots of water. 5.45pm: Just got out of the bath - had to take a hot bath because I couldn't get warm otherwise. I feel like I'm detoxifying already, must be mostly due to blood electrification and not enough water. (I often feel cold after blood electrification.) I have a tense feeling around the head, like the beginnings of a headache. 7.30pm: I don't feel like eating anything (except cooked food), don't feel hungry either. But I'm very tired so going to try to sleep. Many people report needing more sleep when detoxing. Couldn't sleep so got up again, ate an avocado on its own - no condiments - and some clementines. 00.30am: Going to sleep though not sleepy now. Drinking water. Slight headache. Took 4ml valerian root tincture (not raw) to try to help me sleep. How to know good olive oil? Good-quality olive oil is hand-picked, stored in tinted-glass or stainless steel containers, truly cold pressed (the seller must be able to explain the process the oil went through) and organic. Olive oil gets damaged by daylight and heat, although not as quickly as other vegetable oils. Many companies have been found out recently to sell inferior-quality olive oil, even if they say 'extra virgin' or 'cold-pressed' on the label. Note that unfiltered olive oil is cloudy where as filtered oil is clear. In my opinion it is ok to buy more expensive olive oil if one uses less of it anyway, while on a raw food diet, as not as much food is needed due to eating high-nutrient-content foods. Did some weight training, and 'the spine twist'. Breakfast: Avocado, B12 (2000mcg), water, iron, D3 vitamin, niacin, C-vitamin (note: the supplements, apart from the iron, which is in water, are not raw). 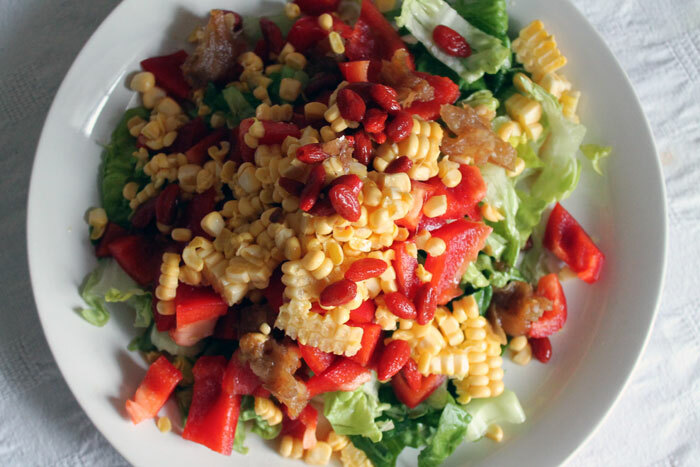 Lunch: Corn salad (picture below), ingredients: two different types of green lettuce, red bell pepper, soaked goji berries, soaked dates with soaking water, raw sweetcorn (cut straight off the cob). 2.50pm: I constantly feel like snacking on something - I guess I have a habit of constantly thinking about food. Tempted to drink hot tea but I won't for now. Feeling a little cold again but not too bad. Otherwise no detox symptoms. Just a little tired because I (again) didn't sleep that well after waking up at 5am last night. The beginning of the night I slept very well, maybe thanks to the valerian root tincture. 3pm: Ate a banana and a smoothie: 1 grapefruit, 1 tbsp spirulina, water. 5.25pm: My body feels a bit out of balance somehow, I feel like I need to eat something fatty, like nuts, but I don't have any nuts that are definitely raw. So I will just wait to see if this is just an adjustment period that my body is going through. 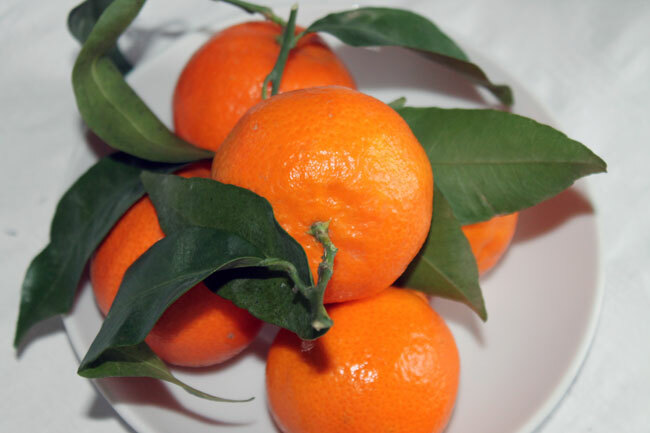 6pm: Two clementines, B12 vit (1,000mcg), iron, C-vitamin (4g). 6.30pm: Suddenly I feel exhausted again. I ate two dates, one avocado, an apple and water. Went to bed around midnight. Was feeling tired but not sleepy at all.